These have to be the best rusks I have ever made. They combine my trail mix with a standard rusk recipe and they provide me with a feeling of being healthy with every bite. I find rusks so easy to make, and so rewarding to enjoy. An airtight container sitting on my desk will not last Dave and I a week. I ate these trail mix rusks as a mid morning snack and Dave had them with his morning and afternoon cup of coffee. They are perfect for me to have in the car as well, for the days that I am on the road before 7am and not coming in to the office. Rusks are such a South African treat, and this recipe has been sent to a friend of mine in London. She has lived in the UK for longer than she lived in South Africa, but the taste for rusks never goes away. I hope she enjoys my trail mix rusks as much as I did! Great recipe, definitely worth a try! I have never heard of rusks Tandy, other than for babies to teeth on so they are clearly a South African treat. These sound very interesting so perhaps I will have a go. Great tip about pushing the cranberries down so they don’t burn. With all the nuts, seeds and cranberries, I can see why these would be a great snack. 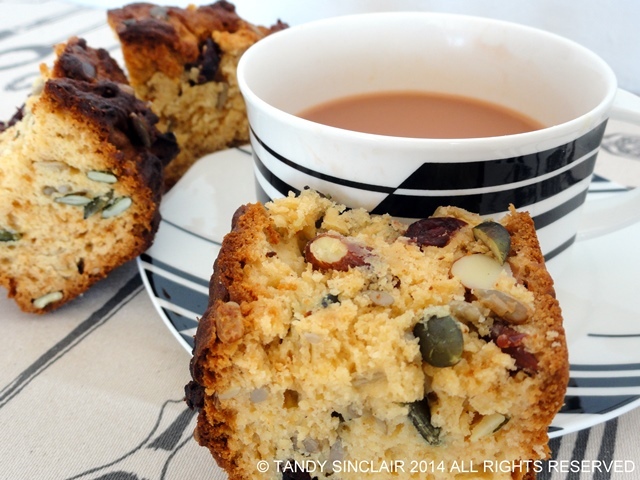 I am going to have to make this Tandy, I believe you have written about rusks before and these sound wonderful. Rusk isn’t very popular here in the U.S. (I guess because most people don’t really drink tea here the way it’s drunk in most other countries) – in fact rusk is almost impossible to find. Thanks for sharing your recipe – it looks delicious and nutritious. I’d be happy to eat these for a snack, after a run, or for breakfast! I need to keep a bag of these in my handbag. I get so cranky when I get hungry! I had never actually heard the work rusk before so I just had to look it up! I figured from the photo is was a cake or similar 🙂 I like the idea of using some trail mix in there! I’ve never tried rusks before but these look tasty! I am new to rusks but your normal one & this special one looks absolutely divine! This is sort of a cake mixed with a bread structure? Yummm! You can’t beat a good homemade rusk.